DISSING+WEITLING is the architect behind the stunning design of two suspension bridges which will become a Lusail icon. The reference to Qatar’s “Q” is clear, with the O-formed steel pylon crossed by a transversal deck. The design for the Lusail Ring Bridges celebrates the latest achievements of Qatar. It exhibits refined simplicity in a clear form. 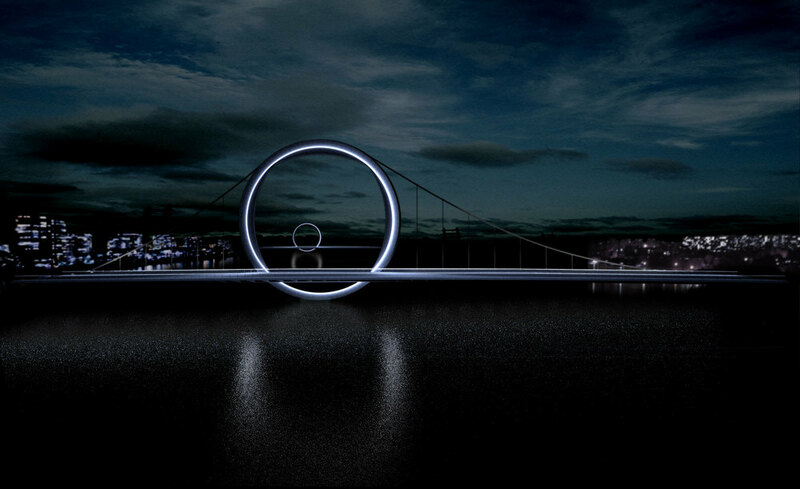 The design responds to the opportunity to create a very unusual, yet beautiful iconic bridge. The elegance, simplicity and boldness of the scheme derives from the idea that an O-form is a very powerful sign that carries within itself deep and ancient symbologies. The wheel bridge is unique with its simple, timeless and elegant design and will be the first of its kind in the world. The structure, so appealing and yet so challenging, will become an instantly recognisable landmark.The two twin bridges will be placed parallel to each other with a distance of 800 metres, which will allow them to be seen simultaneously. The view of one circle within the other when two bridges are seen from a certain angle will also be a remarkable featureelegance of the pylons while reinforcing an aesthetic connection with the faceted piers. Lusail rejser sig som en ny bydel i disse år op af havet nord for Qatars hovedstad, Doha. 21 kvadratkilometer fordelt på fem kunstige øer med luksuslejligheder, kontorer, golfbaner, badestrande og førsteklasses hoteller. DISSING+WEITLING architecture står sammen med COWI bag to broer der med et opsigtsvækkende design - ikke mindst broprofilernes klare reference til Qatars 'Q' - har opnået ikonografisk status for den ny bydel. Konstruktionen følger et hængebrokoncept hvor pylonerne udgøres af to kæmpe stålringe der hæver sig 50 meter over havets overflade. Ringene laves af højstyrkestål, og for ikke at bryde cirklerne er den 28 meter brede brodrager delt i to og forbundet på tværs med ståltværbjælker.